The Financial and Estate Planning Council of Huntsville is an interdisciplinary organization for professionals involved in financial and estate planning. The Council's primary objective is to provide a better understanding of the services performed by attorneys, life underwriters, trust officers, accountants, financial advisors, and others substantially involved in estate planning and to promote cooperation among them. Our meetings provide a venue for education and discussion of various, up-to-date estate planning topics of common interest. 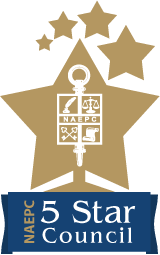 In addition, our members are afforded exclusive benefits through the National Association of Estate Planners & Councils ("NAEPC") membership and the opportunity to network with others in the field. The Council welcomes prospective new members and guests to attend our lunch meetings which are generally held on the third Thursdays in February, May, August, and November. Reservations are required. Associate Non-Voting Membership for professionals who have practiced financial planning, estate planning or related subjects for a period between 2 and 5 years. If you are seeking guidance regarding your estate planning, please use our membership list to assemble a team of professionals who are dedicated to their estate planning practices. We look forward to working with you!